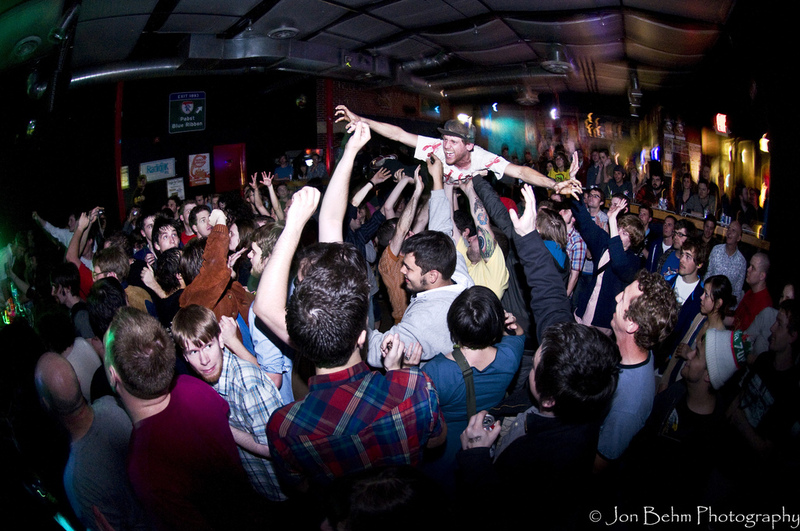 Venue: The Triple Rock is a mid-sized West bank venue popular with the punk crowd, due in part to its being owned in part by a member of Dillinger Four. Booking: The Triple Rock attracts a lot of Punk and Metal bands, with a smattering of Hip Hop acts thrown in and the odd indie rocker. Most of the bands they book can be characterized as loud. Concert Experience: Though the Triple Rock’s sound is ok, the lighting is poor to point of barely being able to see bands at times. The interior is stark and mostly cement, with a large sunken stage area. The venue does not take credit cards, but an ATM in the hallway will give you cash for a ludicrously big fee. Drinks: The prices aren’t terrible by music venue standards, but aren’t great either due to a lack of drink specials. There is a standard mix of wine, beer, and spirits without much on the unusual side. Staff: The Triple Rock staff looks like a motley, tattooed crew, but they generally aren’t rude or unfriendly. They do bounce a fair amount of troublemakers and don’t really give out second chances freely. Parking: Tiny lot in the back is always full. Surrounding streets are one hour parking. Good luck. The Inside Scoop: Men’s bathroom now has actual partitions separating the toilets!